First truth. I begged Mie to let me be part of this series. Truth two. Mie is very gracious and let me in. Third truth. 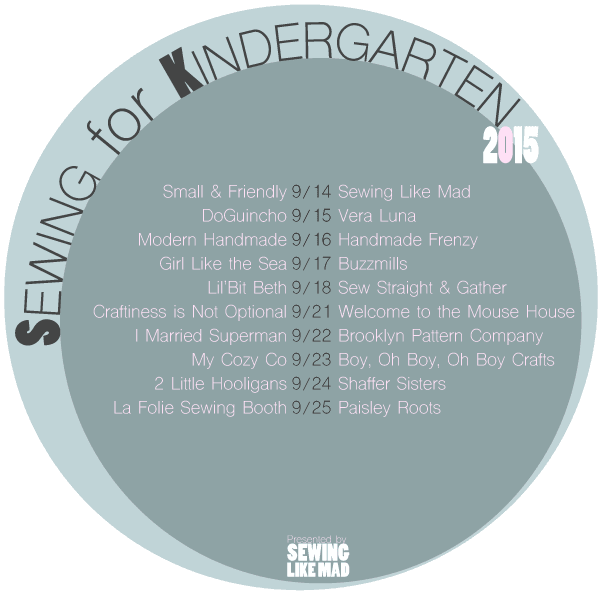 This is one of my very favorite sewing series' that I look forward to each year. No joke, I am ecstatic to be here (even if I invited myself). At this point, I'm going to drop the whole "truth" phrasing and you can just assume that everything I say is honest to goodness from here on out. ;) In fact, I'm gonna let you in on a few truths that you might not know if you're a first time sending your kid to school mom, which I am this year. Before I sent Lila to school, I fretted. She's my oldest and I just didn't even know how I was gonna deal. And I worried. Would her teacher understand that she's the most adorable child on the planet? Would she have friends. Or worse, would she be a snot-nose to other kids. When does the bus come? What if she neeeeds me?!?! It also meant that a chapter of my mom life was over. We've had all our babies really close together and we've always been home and I was aware that sending a child to school meant we'd be opening a new chapter in our family. No more having all of my kids around me all the time. No more wearing pajamas till noon. No more let's go anywhere whenever we feel like it. Sigh. BUT here's the thing that I didn't realize. Having a child in school is so much fun! The structure, the joy of seeing my child learn, the homework, the after school snacking, the glimpsing into what my child is becoming, the waiting and praying that she'll have a good day. All of it! It's really is so much fun for us! And what better way to celebrate trying a new "first" than sewing up a First Day Dress from MADE? This pattern is a blast! The fit is true to the sizing chart and the finish is clean (hide all the seams, right?) It's always nice to get a professional finish without a lot of fuss. I sewed this in a 4T based on Lila's petite measurements and it fits perfectly! I used a chambray from Joann's. The back button closer makes sewing simple too. And throw on a sweater and we're ready for fall! I guess I'm not one of those mom's who is like, "Oh good, my kid is gone! Let's partay." And I'm not weeping over her being gone either. Lila and I defined how we felt about the first day of school as "nervexcited." Ya know, that jittery, but can't wait kind of feeling? In the end, I'm so impressed by Lila's determination. She inspires me to be brave and try something new. Even if it's hard. Because there's always gonna be a first day for every new thing. If we didn't have first days we'd be stuck waiting. I mean really, what's life like without a little nervexcitement sprinkled in here and there? Bring on this new chapter, life. We're ready! I put a silly little video together to remind me to try something new. Enjoy! Thanks again for having me Mie! Check out all the other fun Sewing for Kindergarten looks over at Sewing Like Mad! My gosh Bethany you are hilarious!! And you did NOT beg me for anything silly!! And your little big girl is adorable....she really like rules?! Amazing :-) The dress is super super cute and I LOVE the fabric you have used for it. Just perfect! And 'nervexcited'....how is that not a word already?! Haha. PS. Love the video. Bethany, I love that video! It made me cry -- I'm not sure why. Maybe because I really miss that happy first day of school experience this year. Even teaching helped. Thanks for sharing this precious little memory, that will be a real treasure in years to come. I also love the simplicity of the dress. So cute! The dress is darling. I especially like the girl in it. The demographics and background of the children attending this Phoenix kindergarten is a good mix (something i was very particular about seeing as how my son is of mixed race).